A Times of Israel article of July 15, 2016 by Italian correspondent Rossella Tercatin quotes at length International Catacomb Society Executive Director Jessica Dello Russo about structural and artistic features inside of the Jewish Catacombs of the Vigna Randanini in Rome. The Times of Israel article also includes observations on the Vigna Randanini site by retired laborer for the Pontificia Commissione di Archeologia Sacra (PCAS), Alberto Marcocci, who is rightly identified as the individual who knows the site best, thanks to over forty years of employment as a catacomb excavator and restorer and twenty in his present position as custodian of the Jewish catacomb site. 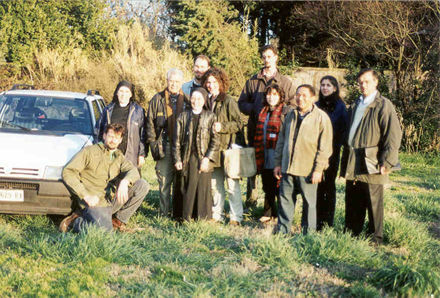 As one of the PCAS's chief diggers, Marcocci often accompanied scholars and other visitors to the Christian and Jewish catacombs (the latter under Vatican jurisdiction until 1986), including ICS founder Estelle Shohet Brettman, who took much pleasure in the subterranean visits with her "Diogenes". Images of Marcocci and Brettman are here. The link to the Times of Israel article on the Jewish Catacombs of Rome is here. Photo: Alberto Marcocci, Jessica Dello Russo, Suor Maria Francesca Antongiovanni of the Catacombs of Priscilla, New Liturgical Movement editor Gregory Di Pippo, and other visitors to the Vigna Randanini catacomb.